← Fighting Parkinson’s, and the Los Angeles Workshop was energetic! For those of you who have been reading this blog for a while, periodically you will see a comment from a woman named Margriet. Margriet is from the Netherlands, and she has been Fighting Parkinson’s Drug Free for two years by doing the Recipe. She had a wedding to attend in the States, and she contacted me a couple of months ago to see if she came through Tampa on her way to the wedding, would I be available for in-person coaching. Of course I said yes! This post is written with her permission. Margriet arrived in Tampa a couple of weeks ago on a Saturday evening. The following day, Sally and I picked her up at her hotel to go to lunch. When Margriet opened the door to the hotel room, my first thought was “this woman must have reached her full recovery on her plane flight.” Although this was our first meeting, we hugged like old friends, and then we walked to the car to head to lunch. Other than a “less-than-perfect” walk, I saw no Parkinson’s in Margriet, particularly as she walked down a flight of stairs. The three of us had lunch, and it was a delightful time. To an outsider, I feel that we would have appeared to be friends for 20 years getting together to chat about life. I have written in the past that although it is Parkinson’s that brings us together here on this blog, it is the sharing of our lives that brings us closer to each other. And that is how lunch was with Margriet…meeting this woman from the Netherlands for the first time, and just sharing our lives over lunch…feeling like long-time friends even though we met in person just 20 minutes earlier. After lunch, Sally headed home, and Margriet and I spent the rest of the day working on her Parkinson’s recovery. We covered all of the aspects of the Recipe, the complete soul, mind, and body healing. The more time we spent together, the more I felt what I feel during the time I spend with those of you I am coaching, including those of you I have met in person…we all are the same in our Parkinson’s. So, whether you are Margriet in the Netherlands or Howard in the States, you are one of us…the connection of Parkinson’s and sharing our lives that brings us close to each other. We are the ones who understand each other better than anybody because of the connection we share. How much more clear could this be than to spend parts of a couple of days with somebody I never have met, never have spoken to, never have Skyped…only have exchanged emails…and we instantly knew each other and were friends. Sally was there, and she, having held my hand through the journey, felt the connection as well. Three of us like old friends. It was real, and it was delightful. It was recovery. Our time together is cherished. Hello Howard, This is Wonderful news about the tremendous progress of a other one of our community! I love reading your reaction to seeing Margriet for the first time: “this woman must have reached her full recovery on her plane flight”! The recovery bond we all share is amazing, and your description of what it felt like to meet for the first time after knowing each oth through emails is so beautiful. And also, of course, something I know well firsthand from getting to meet you in person this summer; we were already such dear friends, remarkably close. At the end of my daily qigong practice when I thank my teachers, I always name you and send love and gratitude to you. Margriet , I am hoping that your full recovery may come on your return flight! But if not, I know that you will be steady on course, happy and unhurried as you make your way to recovery. It sounds like you are very close and doing great!!! My very best wishes and prayers are with you. I have faith in your recovery. Thank you for another boost of motivation………..just when needed the most!!!!! Your timing is amazing and serves as a literal lifesaver. I often recite a quote when struggling through tough times. “Success is often nearest when defeat seems inescapable”. We are all on the same path together and a family of sorts! I read once that we go through certain struggles so that we can be more understanding and compassionate of others experiencing the same thing………having walked in those shoes! It creates such a bond! Thanks Howard for always being there for us! Thank you for this stimulating post with the reminder of the Tortoise approach which is so important and so easily neglected. My thanks to Margriet for sharing her experience with us all as we journey to full recovery. I was becoming a little too impatient and this has reminded me there is nothing to fear and much to gain from the challenges ahead. ..on the road to Recoveryville. I was off- line for a few days and just checked in and read Howards account of our meeting and your comments, wonderful. I have returned home, invigorated and determined to continue my road. We all take our individual and different roads, some are shorter, others longer, some of us may take a detour, yet we are all heading for the same destination. Dear Howard, Dear Margriet, Dear Marie and all our fellow travelers …. I am so very grateful for your collective wisdom, direction, support, and companionship. It may seem odd, given the nature of the challenges we often face with PD…. but I am grateful for this journey and determinedly committed to the road in front of me. I like being the tortoise… so much easier to witness the beauty…. and of course you all are very much a part of that! Thank you, Howard and everyone in this community! It’s so nice to know that I’m not alone on this journey and that there are others out there who don’t think I’m crazy for choosing this “road less traveled”! 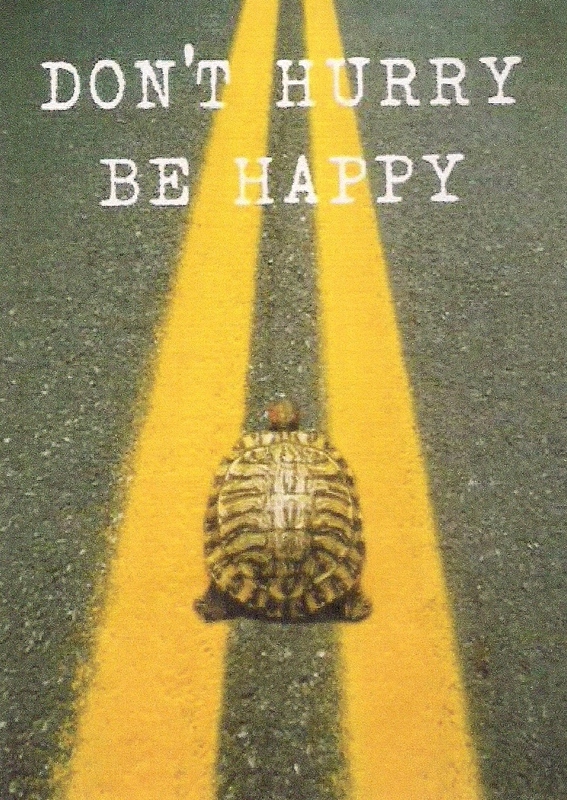 Margriet, thank you for reminding me about the turtle! Sit down. I played 9 holes of golf Sunday. Not totally pain free or PD drug free yet, but out there not giving up! Ditto to all the other comments and best wishes to us all. We all get impatient. 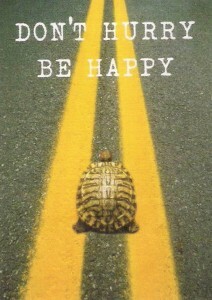 Its a good lesson to learn as the book named The power of slow. Thanks to Howard for your encouragement.